Short biography on the member of the Communist Party controlled resistance to Mussolini who broke with Leninism and became active in the Pisan anarchist movement. 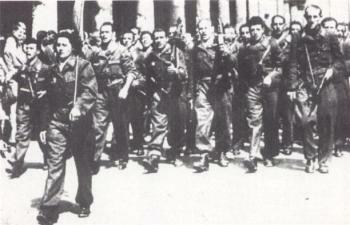 Born in Asciano Pisano in 1923, Renzo Vanni as a youth took part in the Communist Party controlled resistance against Mussolini (partisans in Milan pictured, above). A teacher of French literature, he was very active on the cultural scene in the city of Pisa. After the Hungarian uprising of 1956 he began to distance himself from the Communist Party and joined the anarchist movement. From 1965 to 1973 he was intensely active in the Federazione Anarchica Pisana (Pisan Anarchist Federation) then in the Gruppi di Iniziativa Anarchica (a split from the Italian Anarchist Federation founded in 1965) as an organizer of conferences and as a journalist. He was very active on the editorial board of L’Internazionale, journal of the GIA, then on that of the journal Il Seme Anarchico, above all for his notable series on the Resistance. He wrote a number of books among which La resistenza dalla Maremma alle Apuane, on the Resistance, as well as a Resistance novel Un mare di foglie about the Resistance groups in the Pisan hills. Afflicted with an incurable disease, he gradually retired from public life, cutting down on his activity with the movement. He died on 21st May 1999.